“Where are all the trees?”, Holly said in shock the first time we drove down to North Padre Island in Texas. Growing up within walking distance to Kailua Beach, one of the most beautiful beaches on Oahu, she was not prepared for the sight of what was essentially a barren, desert island. And if you’ve seen one beach in south Texas, you’ve pretty much seen them all. There is very little differentiation. They are all pretty much flat, have no shade, and have limited underwater visibility. That is definitely NOT the case here in western Puerto Rico. It seems there is a beach for every occasion here. Steps Beach is part of protected marine reserve so it’s a fantastic place for snorkeling. 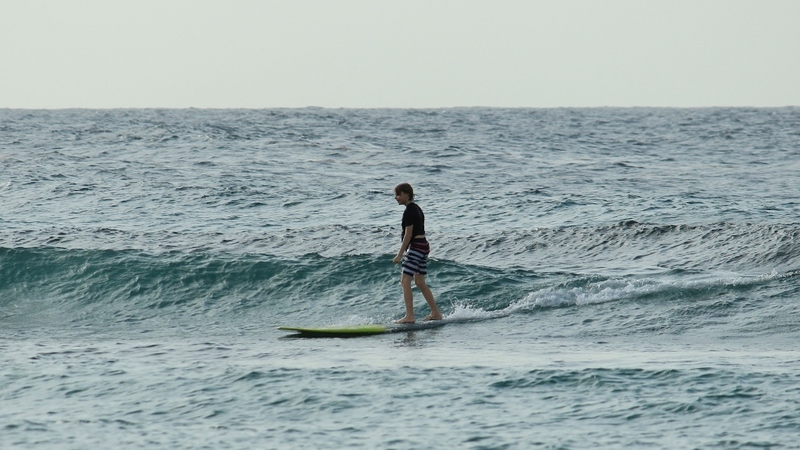 Playa Jobos is the perfect place for learning how to surf. Crash Boat Beach features a pier that is blast to jump off of. One of the most beautiful beaches that we’ve seen in the area is Playa Peña Blanca. If you want access to facilities like showers and restrooms, the balnearios (public beaches) in Rincón or Aguada are the places to go. Even our little beach has it’s own claim to fame as well. Of all the beaches we’ve visited so far, the “Black and Gold Coast“ is our favorite for body boarding. It’s the only beach we’ve been to where it’s shallow enough to stand up out where the big waves crash, which enables you to jump out in front of them to catch a nice long ride. Now that the calendar has turned to October, the boys and I have been taking full advantage of the great boarding waves we’ve started getting. Although I purchased a surfboard last year, I haven’t followed through with learning how to surf. So it’s really nice to have a great place to go boogie boarding conveniently situated in front of our condo until such a time as I finally get serious about learning how to surf! Of course, the list above only scratches the surface. We haven’t even been to all the western Puerto Rico beaches yet, let alone the rest of the island! I look forward to continuing our exploration to uncover each beach’s unique attributes. I love exploring different beaches in PR because each is a bit different!